There are only a few electronics manufacturers out there which gives you the buying confidence you need just from the brand itself with Samsung being one of them. The South Korean manufacturer have made quite a name for themselves and have easily become one of the biggest names in electronics worldwide. Their lineup of curved HD TV’s is on the cutting edge of technology as they continue to reinvent the entire industry with each new release. A Samsung curved HD TV give you the consumer the best of all worlds including rich colors, amazing resolution, and a true viewing angle from any chair in the room. Curved TV’s offer something that you will never get with a conventional flat TV which is why they have become an instant phenomenon. 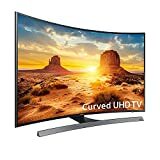 This buying guide and review details everything you need to know to make the best decision on the Top 5 Curved HD Samsung TV’s Under $1000 in 2018. This 55” curved 4K Ultra HD Samsung TV gives you the best of all worlds, and if you’re looking for the best in resolution and high-end Smart features while not wanting to shell out a fortune then this is definitely it. This 4K Smart LED TV allows you to stream 4K content in true UHD resolution which displays the best colors and an amazing contrast. Smart functionality is built right in which gives you Bluetooth and Wi-Fi connectivity which makes it possible to connect other peripherials such as a smartphone, gaming console, PC, or tablet wirelessly. The Samsung 55-inch Curved HD TV features multiple wired outputs including 3 HDMI and 1 Ethernet, and 2 USB. If you’re looking for creating the perfect home entertainment system with a resolution that is 4x sharper than conventional HD with a ultra-slim design and the perfect viewing angle from anywhere in the room, then considering the top rated choice is the only way to go. If you’re looking for something a bit smaller and slightly cheaper, Samsung introduced the 43” curved 4K Ultra HD TV. This TV boasts Smart features which turns your TV into a central entertainment hub with wireless connectivity through Bluetooth and Wi-Fi. The stunning and vibrant UHD resolution of 3840 x 2160 you’ll be getting 4 times the resolution as standard high definition. This Samsung 43-inch curved LED TV streams 4K content and boasts Active Crystal Color which gives you a much wider color expression. The ultra-slim, unique design was specifically engineered to give you the same viewing angle from any degree of viewing. With UHD Dimming technology, Auto Depth Enhancer HDR Premium, and a Smart Remote included it proves this Samsung curved TV is a bargain at under $750. Currently, you can save $350 on this 49” Samsung curved 4K Ultra-HD Smart TV giving you the best resolution out there along with wireless connectivity. Turning your living room into a true media room all start with the TV, and at under $600 you will instantly do just that. This LED TV takes streaming 4K content to the next level with a wide array of HDMI and USB inputs for connecting multiple peripherals. Samsung has made quite a name for themselves with curved TV’s, in-fact, they are undeniably the industry leader. This 49” model gives you a full color pallet with PurColor and the newest wave of TV technology with High Dynamic Range (HDR). The slim, curved design draws your attention from anywhere in the room without the frustration of visual distortion that is seen with traditional flat TV’s. Another bargain is the Samsung curved 49” TV which gives you Smart technology and boasts a full-HD resolution. This high-end LED TV features a 120CMR refresh rate, wireless connectivity including Bluetooth and Wi-Fi, along with 3 HDMI and 2 USB inputs. This 6-series curved HD TV features a powerful quad-core processor which gives you immersive depth, rich colors, and amazing contrast. With features built right-in including Auto Depth Enhancer, Smart Hub, Smart Remote, and 1080p resolution, it once again proves that quality doesn’t have to cost a fortune. Another 6-series Samsung curved TV option includes an AmazonBasics High-Speed HDMI cable out of the box. This cable works wonders when streaming 4K content from providers such as Amazon Video, but was truly designed for gaming and sports enthusiasts. The amazing color pattern and with a 120 motion rate you would be hard-pressed to find a better option out there. With wireless connectivity and Smart functionality, you’ll be able to create the perfect media entertainment room. With numerous inputs including 3 HDMI and 2 USB you’ll find this central hub is more than enough to connect all of your peripherals and take advantage of true 4K resolution at 3840 x 2160. Feel free to ask us any questions in the comment section below, and if you’ve already purchased one of the above please share your experiences with the rest of this community.